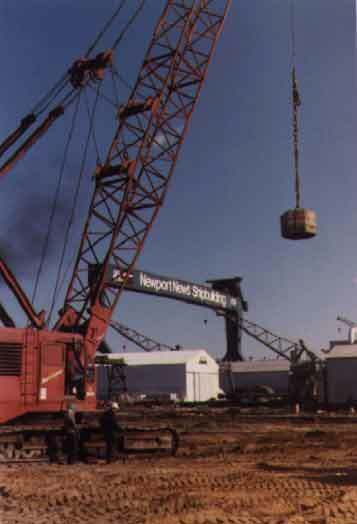 Owner - Newport News Shipbuilding & Drydock Co. The site of a large industrial building for the Newport News Shipbuilding and Drydock was underlain by uncompacted fill, composed primarily of cinders and sand. The fill was in turn underlain by alluvium. There was a thin stiff crustal layer at the surface, which was underlain to a depth of 30 feet by fill material with SPT resistances in the 2 to 10 bpf range. The alluvium consisted of silty sand and clayey sand with thin layers of silt and clay. The water table was located at a depth of about 8 feet. Dynamic compaction was performed with a 17 ton tamper dropped from heights of 50 to 60 feet. Standard penetration test resistances performed after dynamic compaction verified that the specified depth of improvement of 30 feet had been achieved. Crater depths were in the range of 4 to 8 feet. Sand was used as the crater backfill material. Soil modulus values of 150 tsf were achieved below the crustal layer to a depth of 20 feet. Below 20 feet, the average soil modulus value was about 100 tsf. Dynamic compaction was performed for approximately one-fourth the cost of deep foundations.